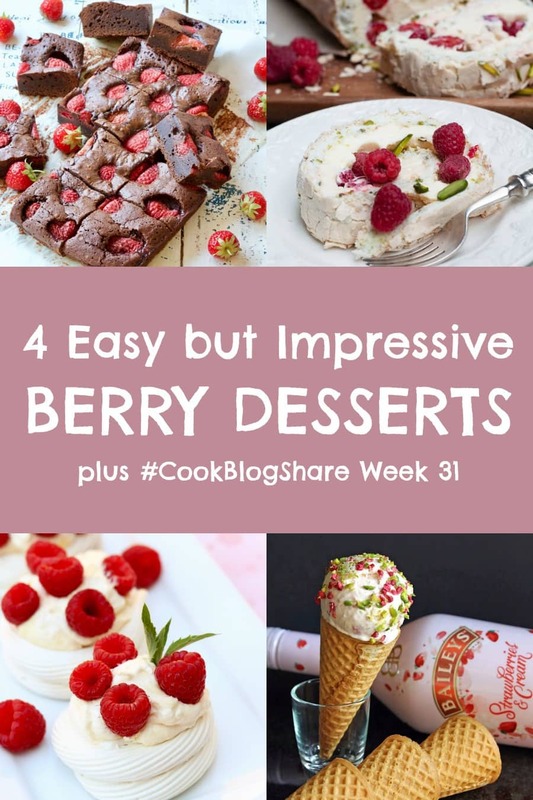 Indulge in these 4 Easy but Impressive Berry Desserts – simple recipes that look and taste incredible! Perfect for summer entertaining. 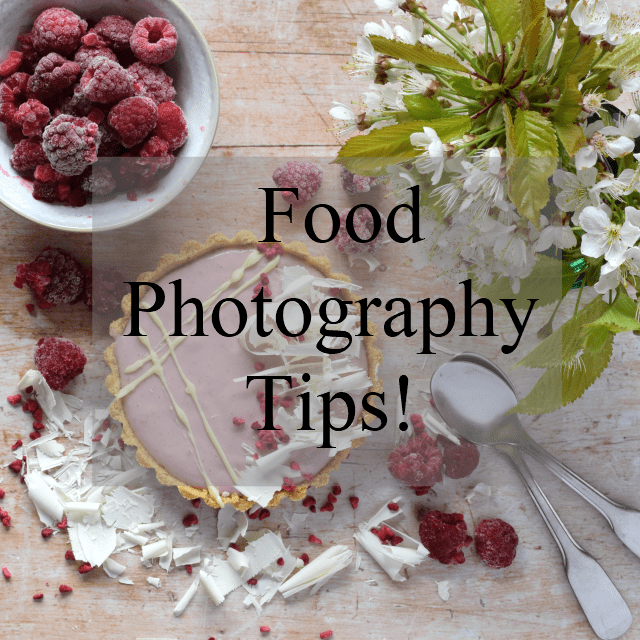 Plus find the linky for #CookBlogShare Week 31 and discover some super useful food photography tips too!! Hey #CookBlogSharers! How are you enjoying the summer so far? I am having a ball. My kids are now 8 and 9 and it’s just a perfect age for summer holidays. We have been enjoying lazy mornings, trips to the park and the library, fun cooking sessions and days out. Plus my kids have really got into YouTube this year, so large parts of their days have been spent making their own videos in the style of their favourite shows!! Like last year, I spent most of the first part of July scheduling my posts, newsletters and social media so that I could spend as much time as possible with the kids during the summer (and take a break!!). It’s never perfect and I still have to work a bit, but it’s so nice knowing nearly everything is scheduled so I can at least enjoy a slower pace of life. If you are finding the summer holidays tough, you might find my post on How to juggle blogging and holidays over on my other website, Productive Blogging, helpful! Speaking of PB, today is a super exciting day because I am featuring my first guest post, from the lovely Vicki Psarias of Honest Mum –all about how to be your own publicist. Something she is SUPER good at. I’ve learnt a lot from her tips. Something else from PB that you might be interested in, if you are a blogger or you run a website: I’ve had a lot of questions lately in my Productive Blogging Community Facebook Group about SEO and specifically cornerstone content, which is such an important part of SEO, but hardly ever gets talked about (and when it does, it’s usually in techno-jargon), so if you are a bit unsure about cornerstone content or you just plain don’t know what it is, head over to my post on how to use cornerstone content to increase blog traffic and find out. OK, enough of the PB talk, time to get back to FOOD!!! Summer berries are one of my favourite things about this time of year. I just love the displays in the greengrocers – it all looks so lush and delicious. I actually find it more tempting than chocolate (though berries dipped in chocolate… now you are talking!!) In fact, I am eating a big bowl of berries and yogurt right now as I type this – my pre-running snack, I’m aiming to do 10 miles tonight so I really need those berries!! And it seems I’m not alone! There were lots of delicious summer fruit recipes linked up last week, so I picked my favourites to share with you today. My selection are not only impressive to look at, but they are all actually surprisingly easy to make. These desserts are all a little bit indulgent, I’ll admit, but hey – it’s holiday time and berries count as one of your 5 a day, don’t they?? ? 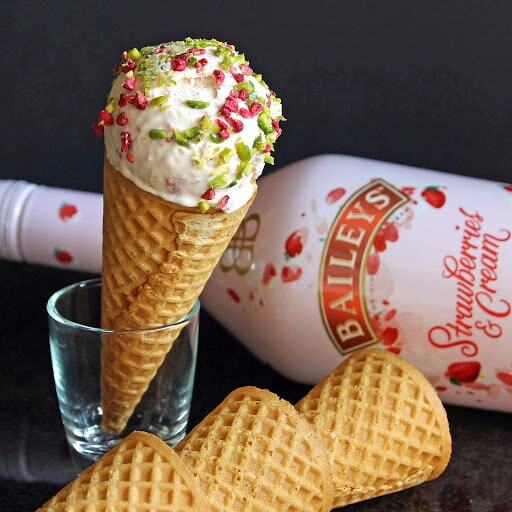 First up, I couldn’t not include this AMAZING Simple Strawberry Baileys & Roasted Strawberry Ice Cream from Kate at Gluten Free Alchemist. Oh wow! This easy no churn ice cream involves roasting strawberries (who knew that was a thing? But it sounds awesome! ), Strawberry Baileys and very little effort. My kind of ice cream. And I love how beautifully she has decorated it with pistachios and freeze-dried strawberries. It looks so, so pretty! 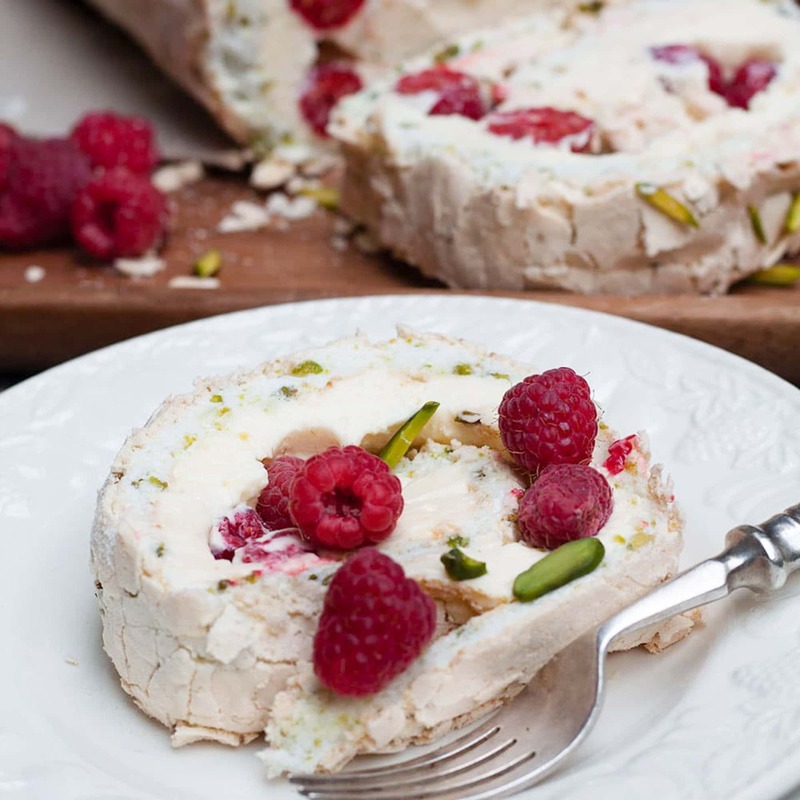 Next up is this incredible Pistachio, Raspberry and Lemon Meringue Roll from Jacqui at Recipes Made Easy. Soft gooey pistachio meringue rolled with a lemon cream and fresh raspberries. Sounds heavenly! And it looks incredible too – perfect for summer entertaining. And, according to Jacqui, it’s way easier than it looks. I do love a showstopping recipe, that’s secretly really easy to make!! Another dessert that looks impressive, without much effort, are these Raspberry & Lemon Curd Meringue Nests from Cat over at Curly’s Cooking. According to Cat, the meringues are the only element which take a bit of time, but most of that is leaving them to do their own thing in the oven. She suggests that during this part of the cooking process you should be in the garden with your feet up and a glass of something cold in your hand. A girl after my own heart. I think that’s got to be essential part of the recipe, don’t you? If I make these, I’m going to be following that part to the letter! ? What’s a dessert recipe roundup without brownies? Luckily Jo from Jo’s kitchen larder linked up her Chocolate Brownies with Strawberries recipe this week. And what fab brownies they are! 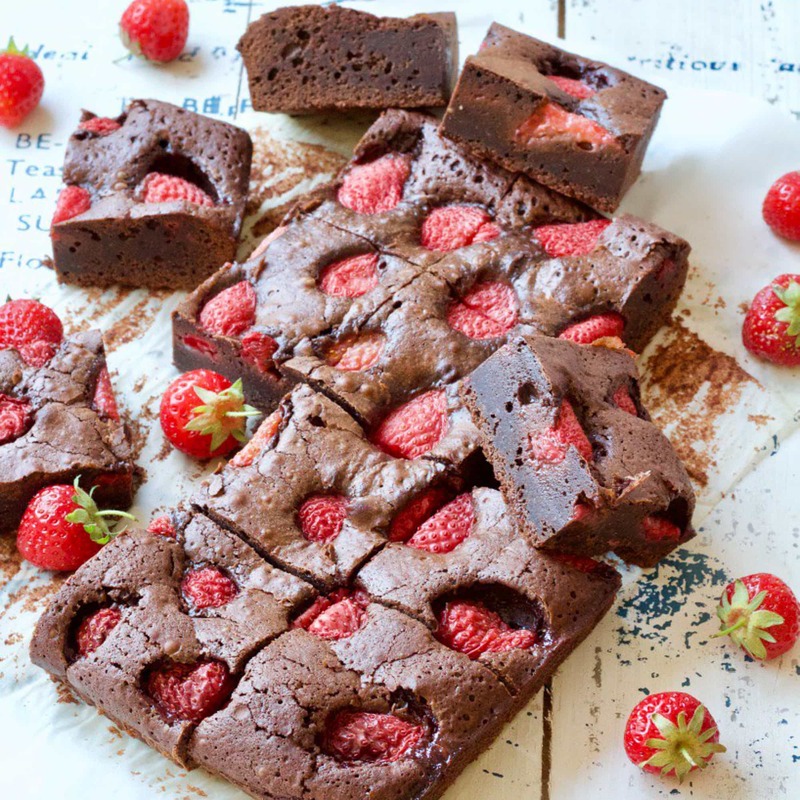 A fairly traditional brownie recipe, but with the addition of strawberries, not just WITH but right IN the brownie batter giving, as Jo describes, “a slightly unexpected burst of additional tangy sweetness” – sounds AMAZING!! And like all the other recipes this week – they look impressive, but are really quite easy to make. BRILLIANT!! If all of these gorgeous, indulgent and impressive looking desserts have got you wishing you could take photos like these, then I have a treat for you this week: Angela from Only crumbs remain has written a brilliant tutorial in which she shares her Food Photography Tips. Her tips are really useful, really practical and don’t require you to have a massive amount of fancy, expensive equipment, so I really recommend you head over there and give her article a read – even if your photography is pretty good, I’m sure you’ll pick up an extra tip or two from it. I know I did!! Fabulous round up, I love this time when all the summer berries are plentiful. I’m also really looking forward to what else is linked up this week summer might be a quieter time for blogs but I love all the fresh and light dishes that we make in the summer. Your summer sounds dreamy. How impressive that you’ve got everything scheduled so you can enjoy it! I’ve been finding the posts on Productive Blogging to be incredibly helpful, particularly the one you mentioned above about cornerstone content. These berry treats look so beautiful and yummy! Perfect for summer. 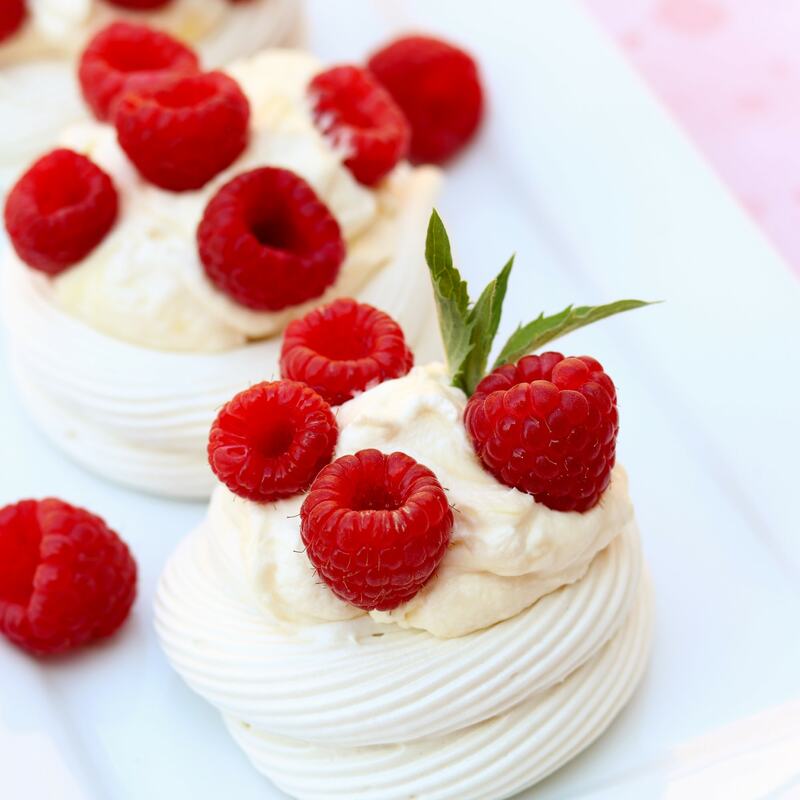 I think I have died and gone to Summer Dessert Heaven……Shamazing Recipes. All of them Summer in a dessert bowl!! Yum. Don’t you just love the joy that huge cardboard boxes bring to the kids. Who needs expensive toys! Thank you so much for including my ice cream Eb… All the featured recipes look incredible, so I am honoured to be in there. Apologies for being so late in heading over…. I wish my summer was a little more organised. At least your kids are more able to occupy themselves. Sounds like you are all having a great time.